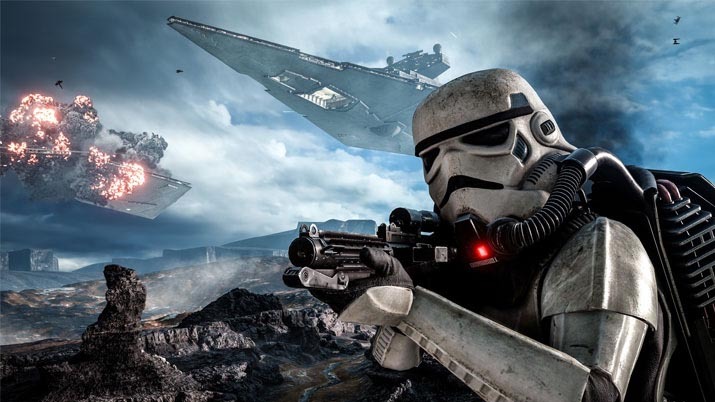 The original Star Wars: Battlefront games hold a special place in the hearts of gamers. For many, it was the first time they were able to play a game of that scope. Whether it was playing cooperatively with a friend right next to you, or the large scale online battles, people were in love with the series. 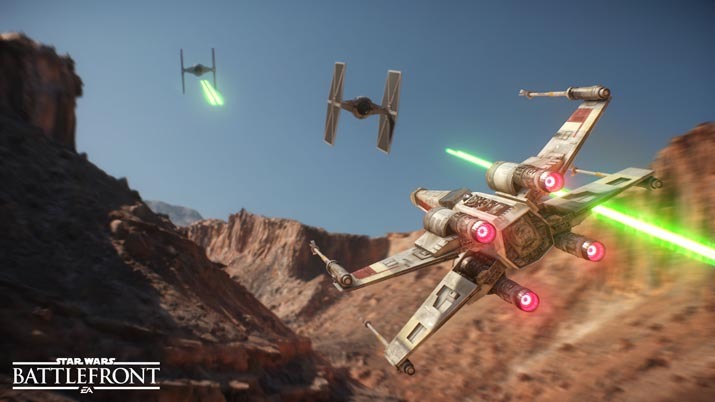 DICE and Electronic Arts look to bring their experience with that kind of large scale from the Battlefield series, and create that same chaotic fun within the Star Wars universe. 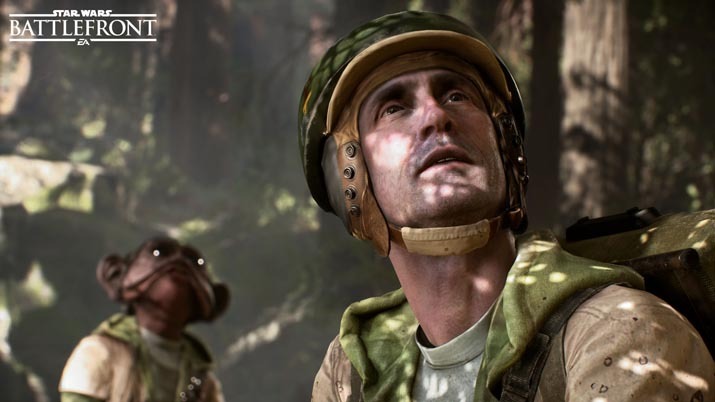 Since the game's beta dropped for a weekend in October, Battlefront has faced some criticism about the depth that the game offers. I remained optimistic, telling people that betas are, traditionally, shallow gaming experiences. I was sure that by throwing in more game modes, maps, heroes, weapons, and the like, that the game's depth would show itself. 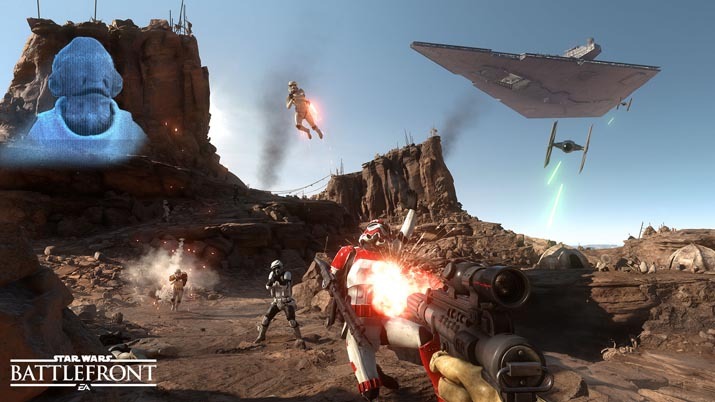 I'm sad to report, that Star Wars: Battlefront has not made the strides I was hoping for. By splitting up Battlefront into four expansion packs to be released over the next year, they've created a very pretty, but thin and repetitive game. And I worry what the game's active population will look like by the time they even reach that first expansion release. The game's clear strengths lie in its visual and audio design. The first time you drop into Hoth, you're instantly given a rush because you're really there. The white-washed tundra looks just how you imagined it when you were lying on your bedroom floor with a pile of Stormtrooper action figures. All the pew pew sounds barraging your speakers are so exactly what you want them to sound like. The Star Wars details are all there, right down to the way the character models obnoxiously flail about when they're shot. 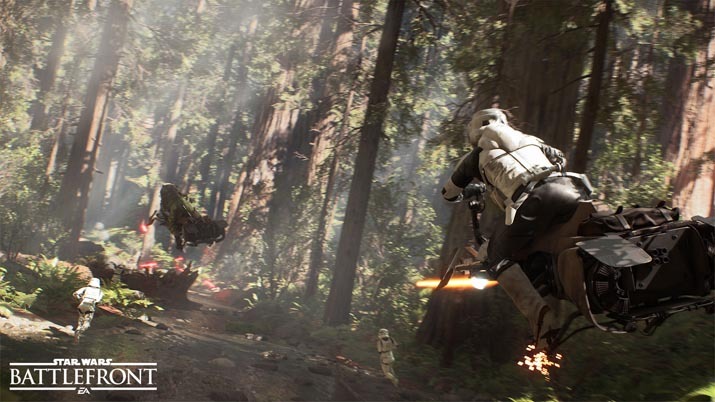 Star Wars: Battlefront looks and sounds like the 2015 Star Wars game you want. Optimization is no issue, as the game runs at a solid 60 fps on my 770. This, again, makes the game all that much more of a pleasure to look at. There are some odd glitches where I've been killed by grenades that were clearly on the other side of a wall or stopped in my tracks by the tiniest tree root on Endor, but there's nothing terribly frustrating as far as bugs go. I like chaos. I think that if I'm a little bit panicked by all the business on-screen, that can be a really good thing for a multiplayer shooter. But once you've seen a Tie Fighter suddenly crash nearby a few times, the shock wears off and you're left with gameplay that seems far too much like banging your head against a wall... or Lemmings... or doing something else that's crazy repetitive and painful. Unlike previous iterations of the series, there is essentially no interaction between friendly players. There is no voice chat, there is no way to heal a teammate or repair a vehicle or do anything other than shoot the enemy and hold E on objectives. That may sound like an oversimplification of objective-based FPS games, but I've never played a game that just feels so simple and easy the entire way around. The skill ceiling sits somewhere around your ankles. There's essentially no penalty for death, as you respawn in roughly three seconds, so you just keep on running into that objective, hoping to poke a hole in the defense so you can be the one to hold E. Die. Do it again. There are three game modes that don't follow this repetitive objective formula: Heroes vs Villians, Hero Hunt, and Fighter Squadron. The Hero characters can be fun to use in a massive battle, because everyone can enjoy slashing and force-choking their way through hopeless grunts, but in these smaller settings they just aren't as fun to control. Hero Hunt consists of finding the Hero, hoping you get the final shot on him to become the hero, then wipe through. This is all done, again, without any communication on the part of the hunters, and you get no credit for doing 99% of the damage on the hero. Fighter squadron was enjoyable for a while, but just like the rest of the game, the skills required to fly are so basic that it gets boring after just a few matches. All of the power-ups that allow you to get power weapons or vehicles spawn throughout the map at random and must be used within 15 seconds of being picked up. So there's no way to coordinate your attacks with these power-ups. For example, if my team is getting beat in Walker Assault and there are a bunch of Y-wings taking down the shields on my AT-ATs, I'd like to get some air support. I want some Tie Fighters in the air so that I can quickly put an end to the “everyone damage the AT-AT” phase of the level. But I can't do that, not on purpose anyway. Those Y-wings are going to continue destroying my chances at winning and there's absolutely nothing I can do to counter that, except for hope one of my teammates or I get lucky with a power-up. None of the guns seem all that different, although I did seem to enjoy the single-shot T-21 more than any other blaster. Star Cards do little to add the game's depth, and having to rank up to them and purchase them using credits feels like I'm just grinding out matches for lateral moves in ability. The missions in Battlefront could have been a real highlight of the game had they been developed beyond the shallow state they were released in. With just a couple of my friends that actually played the game, this seemed like a cool opportunity to battle it out against hoards of stormtroopers or rebel scum. All of the missions play out in exactly the same way: clear 15 waves of enemies, every three waves or so there will be a drop pod with power-ups and/or an AT-ST to take down. On Sullust there's Tie Fighters... that's about it when it comes to twists. This is the closest thing they have to a campaign mode it seems so lazily tacked onto the game. I was disappointed, to say the least. In a game of 20v20, I cannot choose my partner. The only thing in this game resembling player interaction is your ability to have a partner that you can spawn on, and I have no control over if I have a partner, or who they are, unless they're in my party. There's no server browser. It's such a typical PC gamer gripe, but I just don't understand the reason for it. Just to give you an example of the problems a lack of server browser can cause, I was just booted from a lobby for being idle too long. As I write this on my second monitor, my primary monitor was waiting for a Walker Assault lobby to fill up enough so that we could actually start the game. The game I was placed in only had four other people in it, so I decided to be patient and get some writing done. I am, in fact, punished for trying to fill up a near-empty server. But my only other option is to queue up over and over again until I get a game that is at least full enough to start playing. And, no, the inventory screens and customization options just aren't interesting enough to poke around in for more than a minute, especially if you don't have credits to burn. I was relieved when I noticed a “Find a Partner” window on the home screen. “All that cynicism and their answer was right here in front of my face,” I thought. It turns out that the “Find a Partner” button sends you to the forums of the Battlefront website. What? Now I have to use Origin's mess of a web browser just so I can properly find a partner or group with which to play? And that may be okay, if it did allow me to actually find a partner or group, but that's not the case. The top link in the forum is titled “PC Partner & Clan Recruitment,” a thread that has been closed, and only ever viewed just over 1,000 times. This all feels a lot like being given the finger. The character customization aspect of the game simply couldn't be any more dull. There is no character skin that looks noticeably “cooler” than any others. You're just switching the face of your character from one plain-looking person to the next. Is there anyone burning with desire to build up enough credits so that they can unlock the Asian woman with a bun? "Oh man, I can't wait to get another 2,000 credits so that I can look like an old guy with a goatee and without a helmet!" I'm not kidding. The character skins have crazy unique names like “Human 2 – Bald, Beard.” But after reaching level 50 and spending 17,000 credits, you get to turn your storm trooper armor black. What a treat. It's some of the laziest “customization” options you'll find in games, especially a game of this magnitude. I refused to give in to the pessimism that people were spewing because I thought it was just people angrily revolting against EA, the Koch Brothers of video games. I really thought this game had a chance. 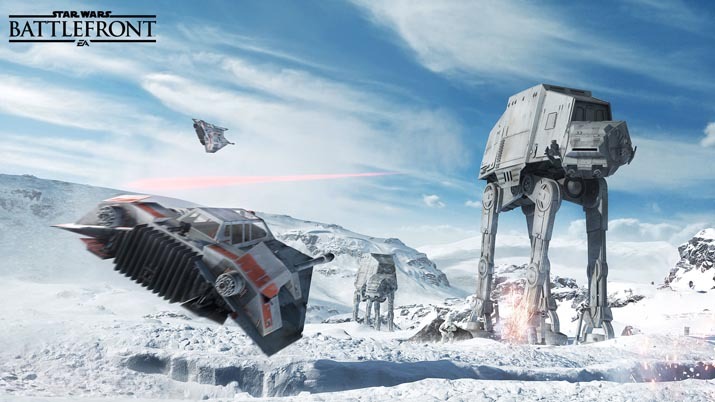 But, ultimately, there's just not much to Star Wars: Battlefront. The gameplay is just so basic, so safe, so maddeningly generic. I know that not every game has to have CS:GO levels of learning curve, but Star Wars: Battlefront does absolutely nothing to differentiate itself from modern shooters other than its beloved setting. It may be a while before we see a game nail the aesthetics of the Star Wars universe like Battlefront has, but I would trade that beauty for a game I know could actually sustain my interest. 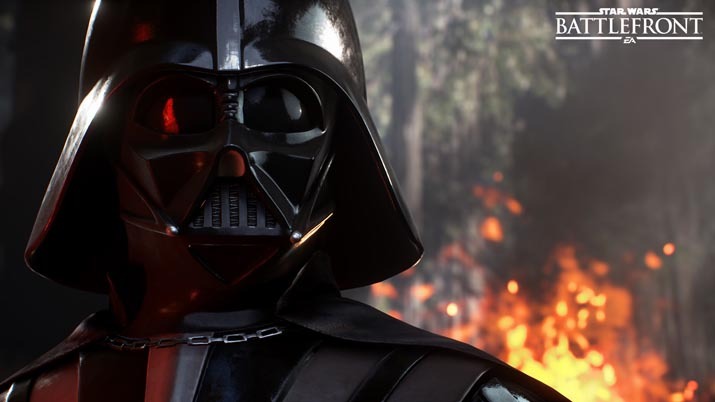 In just a few hours, you will have likely done nearly all there is to do in Star Wars: Battlefront. You will have tried every map, used all the heroes, driven every vehicle (what few there are), and played every gametype. There's little to learn or experience beyond that first trip through everything. The game feels hollow. Hollow to the point that I wonder if the upcoming DLC will be able to revitalize it, and hollow to the point that there may be no one out there playing the game to even enjoy the new content at all. For $60, this game is unacceptably short on content and replayability.